I must be the last person in the world to hear about 10-year-old football sensation Samantha Gordon, but really, it's my children's fault. I almost never go on YouTube unless they direct me to something, and thus far, they had missed her electrifying "Highlights" reel. No longer. 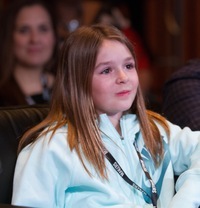 By a happy coincidence, my daughter Annie and I were both at the first MAKERS Conference last week, a gathering of prominent women leaders discussing how to set the agenda for the next 50 years of female leadership. Amidst a crowd of speakers that included Gloria Steinem, Geena Davis, NASA astronaut Cady Coleman and the indomitable Gaby Gifford, Samantha stole the show. Ensconced in the production room, Annie furiously texted me, "Sam Gordon! Sam Gordon! Sam Gordon!" This is Annie speak for "write about HER!" I will, but I am also pretty interested in her father, Brent. A divorced father with sole custody of his three children, he turned to "sports to keep his family together." Sam grew up playing football with her brother and father, and when she started beating the boys on her brother's team in speed drills, her father entered her into the boys tackle football league tryouts. In 2012, Sam competed against 172 boys and placed first in every speed and agility test. He was furious when the coaches picked approximately 80 boys ahead of her, placing her on the seventh of nine teams. Brent told the MAKERS crowd that he had a choice to make that day. He could "escalate this conflict right now and try to force Sam onto a team where the coach didn't want her, and passed her up because she was a girl. Or, I can let her play with the coach that did want her. And her coach told me she was his first pick. He said the other coaches were idiots to pass her up." Brent and Sam stuck with the coach who wanted her, and her "Highlights" reel, compiled by her father, demonstrates the results of that season: 35 scores, 232 carries, 1,911 yards and 65 tackles. But what really struck me about Brent's decision was his confidence in Sam. I work with a lot of parents who might not have made that decision, and insisted that Sam be placed on the first (and best) team, where she rightfully belonged. In fact, given the injustice of the situation, I am not sure that I wouldn't have come out swinging, demanding "equal opportunity" for my daughter. We all want the best for our children, and in a case like this it's all too easy to fall victim to what Ned Hallowell so aptly describes as the "pyramid" theory of childrearing; that is, superior achievement at one level will generate superior achievement at the next. Despite the fact that there is absolutely no evidence to support this theory and ample studies to discredit it, we all want to believe in it. After all, it promises results. But in our pursuit of the end game, we risk losing sight of the process of parenting, the kind of question that prompted Brent's decision; namely, what is best for Sam? To be wanted or not wanted? When seen in that light, one makes an entirely different decision than when striving to have a place on the "best" team. I thought of Sam and Brent Gordon again today, when I opened the paper to read about Mikaela Shiffrin, the 18-year-old Olympic gold medal slalom champion. According to the New York Times, Mikaela and her parents practiced a "countercultural" movement in American youth sports, wherein the focus is on the process of athletic achievement rather than the results. When Mikaela made a major mistake on the course, thinking about the gold medal, she was able to recover by focusing on the process; the practice of making the same error on the course "a 100 times" and knowing she could get back on course. This is the same, deeply-held confidence that Brent Gordon described when he talked about Sam's defining characteristic. As he said, "She's confident. She goes out on that field 'I'm going to destroy you,' not 'I am lucky to be here.' " Or as Sam herself said, "I am always surprised by the number of people that ask, 'How I did it.' "
Now that's confident; a confidence that only comes from endless practice, mistakes, setbacks, recovery and finally mastery. And kids only have these kinds of experiences when parents believe in them, not Harvard. Admittedly, it may be easier to have confidence in children who demonstrate remarkable early promise, like Sam or Mikaela, but both families made choices that valued process over product. And that kind of confidence breeds confidence. Photo used with permission from MAKERS.com.